Making life a litte sweeter! Shake vigorously and pour into high ball glass with ice. Top with club soda and garnish with lime wheel. Shake vigorously and strain over ice. Garnish with fresh rosemary sprig. If incorporating egg white, dry shake and strain over ice. If eliminating the egg white shake ingredients vigorously with ice and stain over fresh ice. Garnish with pineapple leaf and/or a jalepeno slice if more heat is desired. Top with a few dashes of angostura bitters. For maple pickle recipe see left, Veggies can be anything seasonal. Once pickles are made it is best to let them sit for a few hours prior to enjoying. Shake with ice & serve straight up in martini glass. Garnish with pickled veggies. Place all ingredients in a heat proof mug. Add 1 black tea bag with boiling hot water, fresh grated nutmeg, cinnamon, orange zest, and star anise. Let stand for 5 minutes remove tea bag and enjoy! Shake and serve in salt rimmed glass on the rocks. Take 5 bags of black tea bags and place in a full tea kettle of hot water let sit for 20 minutes or until the water is just warm and not too hot. Pour tea into desired pitcher and add fresh or frozen sliced peaches and 1/4 cup of Dorset Maple Reserve Bourbon Barrel aged Maple Syrup (If tea tastes too strong add a little water) Place pitcher in fridge for at least 2 hours. 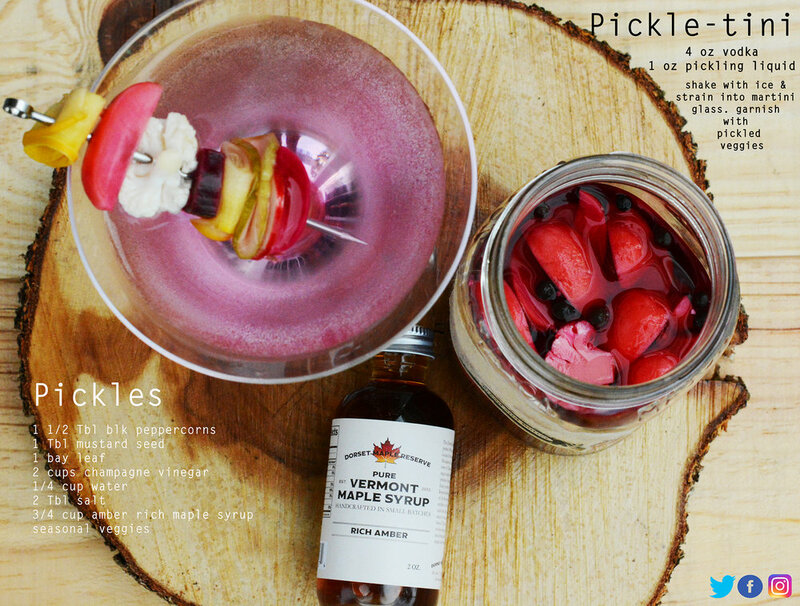 This drink can be served virgin or spiked with your favorite bourbon. Mix well before pouring over ice and garnish with sliced peaches and a fresh Thyme sprig.